One thing I immediately discovered the first time I rode a motorcycle: it can be absolutely terrifying. Motorcyclists often refer to car drivers as “cagers”. There’s a good reason for this. Apart from the feeling you get when you’re riding out in the open, under the sun, wind in your face, surrounded by people who look like they’re trapped in motorized cages on wheels, there’s the actual fact that a car is a metal cage on wheels. I Pretend I’m Invisible: Driving can sometimes be an egocentric experience – we want to believe that everyone is paying attention to us. When you’re on a motorcycle, you need to think along opposite lines, and assume that absolutely no one sharing the road with you can see you. This translates into making your presence known whenever possible. As a rider, I’m ALWAYS using my signal and signaling at least three seconds before I make my intended turn. I begin to brake well in advance of any red lights, stop signs or slowing traffic so that the cars behind me know that I’ll be coming to a stop. And whenever possible I keep a “space bubble” between myself and other vehicles, and avoid being in another car’s blind spots at all times. I do the same when driving my car. I Keep My Head On A Swivel: It’s fairly easy to zone out within the cushy confines of my car; distractions such as music, phone calls or the soothing voice of my door-to-door GPS make it even easier to lose my focus behind the wheel. Behind the handlebars, it’s a completely different story. I’m all about situational awareness. My eyes are constantly moving – I’m looking up ahead at every upcoming intersection, watching every driveway, checking my mirrors and even glancing over my shoulders just to be sure that there are no surprises. (I do this when approaching stops as well as changing lanes – being rear-ended is just as bad as getting sideswiped.) I’m not only watching other drivers – are they checking their mirrors before changing lanes in front of me? – I’m watching the front wheels of their cars, which will tell me if they’re going to slide into my lane. And I’m listening as well, for cars and other bikes that may be approaching from behind. Now I do all of the above when driving. I Never, Ever Tailgate: We all learn about the Two Second Rule when taking our Drivers Ed course – when the vehicle in front of you goes past a particular point, you count off two full seconds before passing that same point. Hard braking is something I want to avoid on a bike – it’s far too easy to lock up the wheels, which will cause the bike to skid out of control. Cars are equipped with anti-lock brakes that allow for hard braking; on a bike I don’t have the luxury of an ABS system to bail me out of trouble. When riding, I add a one- to two-second cushion to the Two Second Rule, depending on how busy the roads are – the more traffic or intersections, the longer I want my trailing distance to be. When I drive, I think along those lines as well, and doing so has kept me out of more than few fender-benders. I Watch Out For Motorcycles: Of course, I’m now much more aware of other motorcyclists when I’m driving than I was before I took up motorcycling. The number of motorcyclists is significant – the most recent Department of Transportation survey, done in 2011, showed that there were 8,410,255 registered motorcycles in the U.S. The risks to riders are significant as well – a study by the U.S. Department of Transportation shows that the fatality rate for motorcycle riders involved in crashes is 6 times higher than that of passenger car occupants. And in 41% of accidents where a motorcyclist collided with a four-wheeled vehicle, the car or truck was turning left – into a lane occupied by the motorcycle, unseen by the driver. Yet many states fail to properly educate drivers on how to share the road with motorcyclists. To combat that, the National Highway Traffic Safety Administration has declared May as Motorcycle Cycle Safety Awareness Month . The NHTSA, working with such groups as the Motorcycle Safety Foundation (a non-profit organization that provides a number of motorcycle riding courses for riders of all levels), encourages riders and drivers to be aware of each other. For riders, this means not only developing the skills needed to keep us safe, but taking extra steps to ensure that we’re visible to drivers. (Yeah, my Day-Glo Yellow helmet might make me look like a Power Ranger – but hey, that means it caught your attention while you were driving.) For drivers, this means sharing the road with motorcycles. And for me, it means always thinking like a motorcyclist – even when I’m behind the wheel of my car. 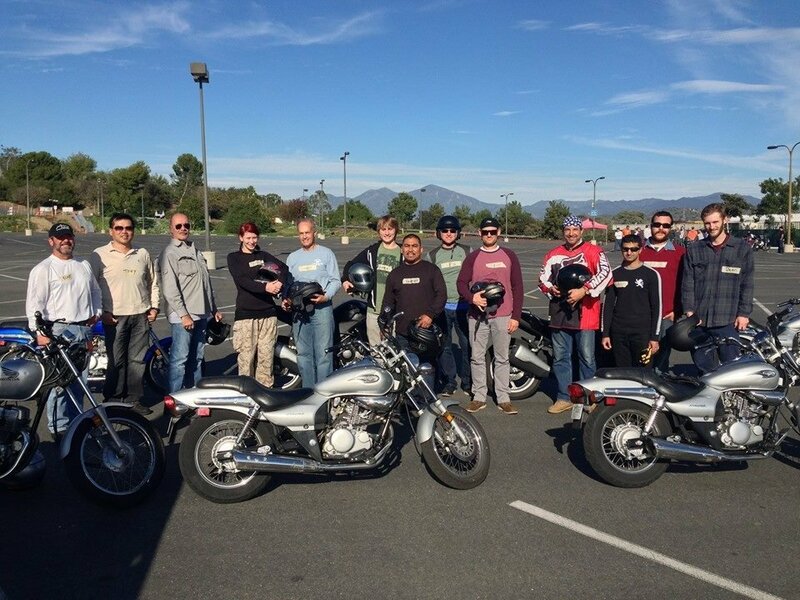 The best way to stay safe on a bike: take a Motorcycle Safety Foundation riding course. Here’s the author (fifth from the right), graduating from his MSF course. If you’re getting ready to take your state’s Motorcycle License Exam, check out I Drive Safely’s Motorcycle License Practice Tests .